Lack of answers to the question "what do I need to make a website?" prevents many people from bringing their businesses to the Web, or being able to assess what it will take to do so or even if it is worth it to their company. It's not that they're not intelligent or knowledgeable about their fields; the problem is simply that the Internet is high tech, and we're not born knowing all about it. So if you have that "it's all Greek to me" feeling, that's pretty normal. In this overview, we'll take a brief look at what it takes — in plain English. Although it may be obvious that you'll need a computer to create a website, we've been asked often enough that we thought we'd mention it. You'll need an account with an Internet Service Provider (such as Earthlink) so that you can log on to the Web, upload your website, receive email, etc. Pages & Programs. Simple websites generally are made up of two main elements: pages and images. The pages themselves are all text (really! ), such as the text you see on this page, interspersed with web page coding that causes browsers to display them as, well, a web page. Get a graphically-oriented program which writes the HTML for you. These will generally work well for you at the beginning, but later on you will probably find that you need to learn HTML. Use a simple text editor such as NotePad, which comes standard with the Windows operating system, and learn HTML. While this sounds a bit more difficult, you can spend the time you'd take learning how to use your graphically-oriented program actually learning HTML — and it's not that hard to learn! This will save you a lot of confusion. Images & Image Programs. Few websites can go without images. At the very least, you'll need a decent logo, and perhaps some pictures to enhance your presentation. Images can really make a website. You will likely find that you need to enhance the images or, at the very least, prepare them for use on the Web. There are a number of image editing programs running from Adobe Photoshop (the expensive industry standard) and Macromedia Fireworks to Adobe's Photoshop Elements, which will allow you add various "effects" (such as shadows) to your images as you prepare them for display on the Web. A web browser is a program you use to surf the Web — like the one you're using to view this page. As you create your website, you'll need to test it in different browsers to see how it will look on the Web and to spot any errors. At a minimum, I recommend testing in later versions of Internet Explorer, Firefox, Chrome and Opera. See our earlier issue entitled Web Designer Tools. Tip: in my opinion, it's a mistake to code websites for only one browser, such as Internet Explorer. Your best potential customers may be using another browser. Once your website is complete, you'll need somewhere to put it so that people can view it on the Web — that is, you'll need a web hosting account. If you're making a personal website, you can probably use the web hosting space your Internet Service Provider (e.g., Earthlink) may have included with your Internet connection account. However, for anything more — and certainly if we're talking about your company website — you'll need professional web hosting. Free Web Hosting. Free web hosting exists; however, it is normally slow, lacks effective or fast customer support, and probably won't give the impression you wish to give to clients and potential customers. Same with cheap web hosting. Web hosts usually have online instructions for uploading websites and setting up email; the better ones offer support by email; the best ones also have phone support. Truthfully, one probably never calls a web host unless something is drastically wrong — which is not the time to be waiting for emails or waiting until the 9-5:00 shift arrives for the day! If you can afford it, I'd suggest going with one of the better web hosts. It will save you time and aggravation, and make you look good (and allow you to sleep at night!). Professional web hosting usually costs around $20-$35 a month; well worth it in terms of making you look professional, wouldn't you say? 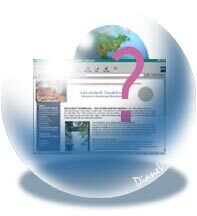 A "domain name" is actually a website address, such as yourwebsite.com. While this may suffice for a personal website, it is an inappropriate address for a company. It's too long to fit on a business card, too hard to remember, looks unprofessional — and don't forget that you'd be clarifying it with clients and potential clients more often than you'd wish. Worse, if you ever change Service Providers, you'll no longer have this address, making you effectively "disappear" from the Web, and the time and effort you've put into getting listed in search engines will now be wasted. That is, you'll be starting over. Getting a website is only the first step; there's the matter of promoting it on the Web. This goes for email addresses, too: mycompany@someprovider.com makes a company look small, unprofessional and unsavvy, whereas you@yourcompany.com does the opposite — and advertises your website at the same time. If you move or change ISPs — or even web hosts — neither your email address nor your domain name change. Domain names are registered, not bought; they normally cost from $10-35 a year. Last but not least, once your website is completed, you'll need to put it (the pages and images) on your web hosting space. This is called uploading. There are quite a few programs available for doing this. One of our favorites is Ipswitch WS_FTP Pro. And then — always, always, always test it in your browser(s). Always. Well, that's it, the bare bones of what it takes to make a website. I hope this has been of help!